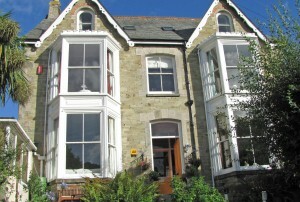 Cliftons is a family-run guest house conveniently located in the beautiful cathedral city of Truro, Cornwall. Cliftons is only a 5-10 minutes walk from the city centre. It is within an easy short car journey of major tourist attractions, such as the Eden Project and the Lost Gardens of Heligan to name but two. Cliftons is a beautiful, impressive, detached Victorian Villa with lots of original features. It was built in the 1890s and is the same age as Truro Cathedral which is only half a mile away. Cliftons is the ideal base to visit Cornwall. We have visitors from all over the world and they love their stay with us especially as we make them feel at home. View what our guests say about us at Trip Advisor and Reviews. We are conveniently placed for visiting Truro and all of Cornwall. Cliftons offers free off street parking in our private car park at the rear of the building. Truro is not only the capital of Cornwall, but also the heart of Cornwall. It is ideally located for visiting all of the county’s attractions and coastline. Cliftons is 12 miles from Newquay and a short distance from Cornwall’s main A30 road. Truro is also on the main line from London Paddington and on National Cycle Routes 3 and 32. Cliftons rooms are comfortable and full of amenities. Our delicious breakfasts are prepared using local produce whenever possible. 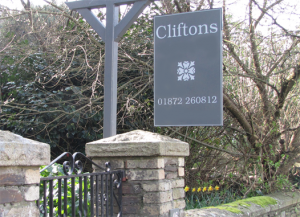 Whatever the reason is for being in Truro, be it a holiday, business trip or perhaps you are just passing through on your way to somewhere else, you will always receive a warm welcome when you stay at Cliftons, Truro’s Premier Guest House. Cliftons is your home from home when staying in Truro.